Here are some quick guidelines for how to create Letterpress Commons content inside our editor. Do you have questions? Try joining our chat room below for support or mention @letterpresscmns on Twitter. Ideally, each article should have at least one image in order to illustrate the topic and create a thumbnail for the article. If you don’t see the “Media” tab at the top of your editor, then you don’t have uploading privileges. You can submit your image separately at our Submit Media page. …have a minimum size of 448 x 318 pixels at 72 dpi. Preferred size (if possible): 896 x 636 pixels at 72 dpi. …be included in the post via the Upload/insert button. No hotlinking images from any external site or serverm. …be inserted in the text by clicking the Insert Link button. …have a caption and an alt attribute. These can be quite short but are mandatory. …have no link. Any links should be inline in the caption text or in the article text. Body text should be inside the editor’s Normal Style. The editor will automatically apply the right styling to each paragraph. Nothing too tricky here. Type away! 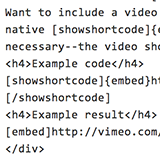 An article’s main sections should have an introductory title inside Heading 2 style (<h2> tags). Subsections of each section should have an introductory title inside Heading 2 style (<h2> tags). These headings will be automatically added to the article’s table of contents. Do not use other Heading Styles (eg, <h1, <h4>, <h5>, etc.). If you are familiar with how to create an HTML table in the HTML editor, by all means go ahead. If not, send us your table as a spreadsheet (XLS, XLSX, ODS, CSV) via our (upload page). We will create the table for you and insert into your article. See (Comments) for instructions on how to earmark where this should go in the article. Letterpress Commons welcomes any and all videos. Please submit videos files for review at our (upload page). If approved, we will upload the video to a Letterpress Commons account at YouTube and insert in the appropriate post. See (Comments) for instructions on how to earmark where this should go in the article. Videos that are hosted at Vimeo or YouTube with a non-Letterpress Commons account need prior written approval by a Letterpress Commons Editor. Use the (upload page) to send a request along with a link to the video. Each article concludes with a list of Contributors. This list is maintained by the Editors to acknowledge the Letterpress Commons volunteer(s) who created the most significant content. Generally, this will be the original author and whoever subsequently created the most significant additional content. If you feel that you are not on the list but deserve to be, contact our Editors to let them know. Visit the Feedback Forum if you feel that Letterpress Commons needs articles that are not currently included on our sitemap. This allows us to make sure your idea for an article fits and also allows us to set up the new article properly.